This shop has been compensated by Collective Bias, Inc. and its advertiser. All opinions are mine alone. #SeeHowFreshWorks #CollectiveBias. 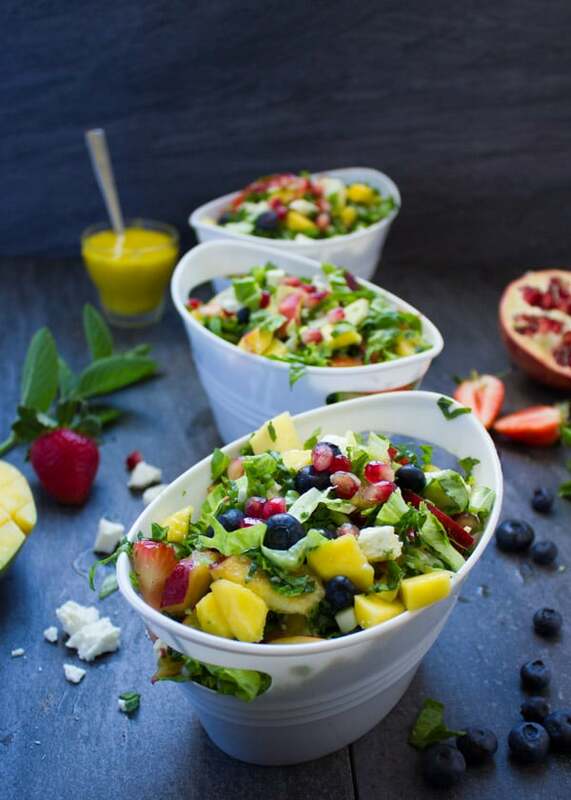 A fruity summery spin on Greek Salad with a simple and sweet Mango Dressing! This vitamin-packed summer salad with apples, strawberries, pineapple, peaches, berries, and creamy feta cheese is refreshing, sweet, tangy, crunchy, and simply fun to eat! 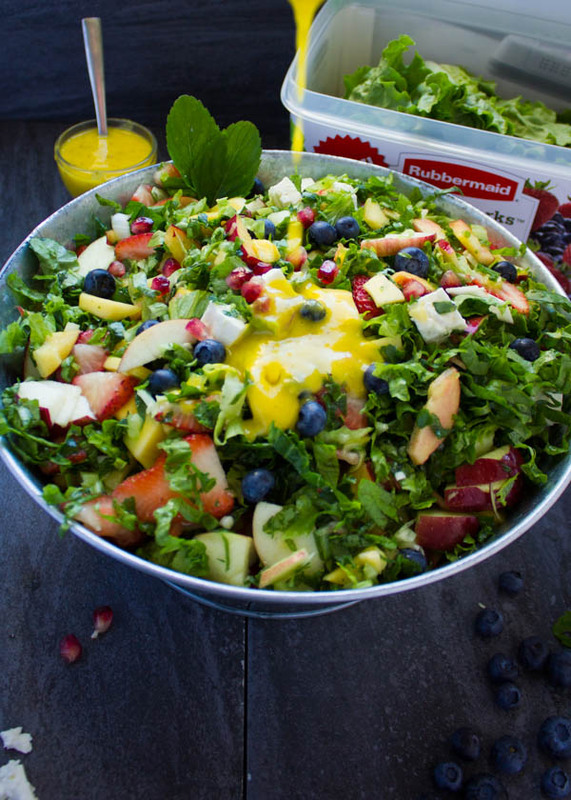 The mango salad dressing helps all the bright and fruity flavors to really shine! 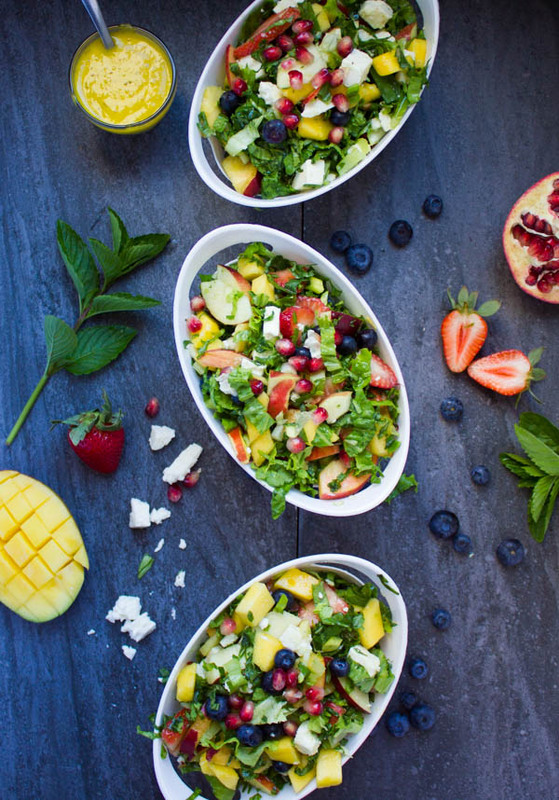 Say hello to my new favorite summer meal—a Fruity Greek Salad with Sweet Mango Salad Dressing! A salad recipe that pairs beautifully with everything. Seriously everything! It’s super refreshing, sweet, tangy, crunchy, juicy, everything! Plus it gets drizzled with a sweet and tangy mango Greek salad dressing that makes the flavor of the added fruit pop! You all know I have a thing for healthy salads. A real thing. So when I say this Fruity Greek Salad is special, you can take my word for it! The inspiration for all these fruits in a salad came from a very fancy cafe we went to last week with some of my friends. We all had eggs, bagels, plenty of coffee and one of my friends ordered a fruit salad. At first we all joked about her “healthy option” and doubted this fruit salad would ever feel like a filling breakfast! As you can imagine we all had a taste or two of that huge fruity salad bowl she ordered. It was lettuce, fruits and a sweet mayo based orange-ish dressing. The taste was SO refreshing! It felt SO sweet and above all, it was really filling! We ended up ordering another bowl and I came home feeling like I NEED to make this and I NEED so add some cheese! 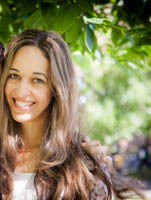 First of all, I think because my roots are from the Mediterranean, Greek salad will always hit home for me and feta cheese brings me so much comfort! But what I love about this vitamin-packed bowl of goodness is really the fruit. Totally the fruit. This Greek Salad is literally summer in a bowl! The list of ingredients for this fruity Greek Salad is quite long because I literally added all of my favorites! 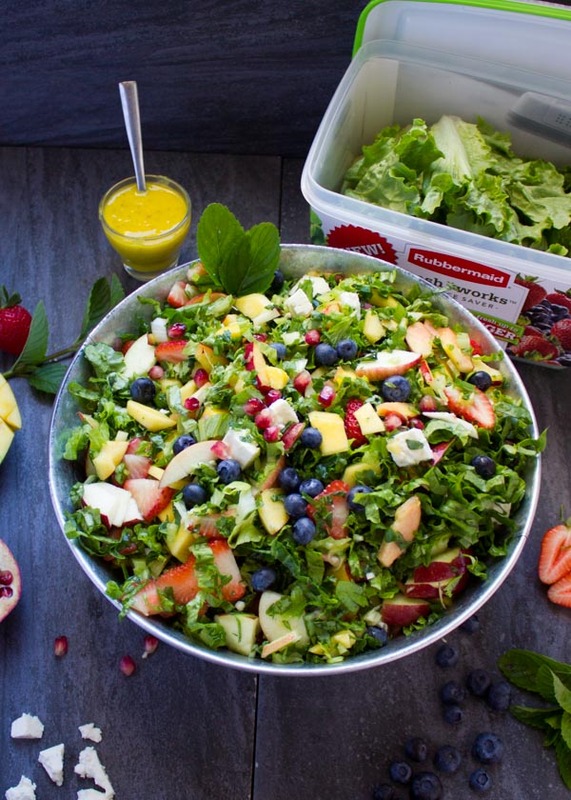 Mango, pineapple, blueberries, strawberries, peaches, apples and pomegranate arils – WOW! While it’s just PERFECT the way I made it, I can assure you it’ll be just as perfect if you add in your fruit and veg of choice. Swap some fruits around, remove the feta to make this it vegan, add a touch of tomatoes or cucumbers if you like – anything that makes this a happy salad day for you! The recipe is simple: Chop your lettuce, and slice your fruit into bite-sized pieces, then put everything in the biggest salad bowl you find. Now, can I quickly mention the mango salad dressing before I let you go? I made it in my mini food processor and it’s a simple mix of mangos, honey, apple vinegar, a pinch of salt, some fresh oregano and olive oil. Simple, yet luscious! I can’t urge you enough to make this salad and I can guarantee you’ll make it more often than you think!! It’s awesome on its’ own, and likewise, it’s awesome paired with whatever you’re grilling this season! To make this an even more filling main dish, add in some grains, seeds, and beans! Actually, black beans would be my pick. Make use of all the gorgeous summer produce as I did! I used strawberries, mangoes, pineapples, apples, nectarines, peaches, pomegranate arils, blueberries and I added in a bit of kale and mint with my lettuce along with some scallions. If you’re a fan of Greek Salads, check out my Orange Lentil Greek Salad or my Greek Salad with Kale! 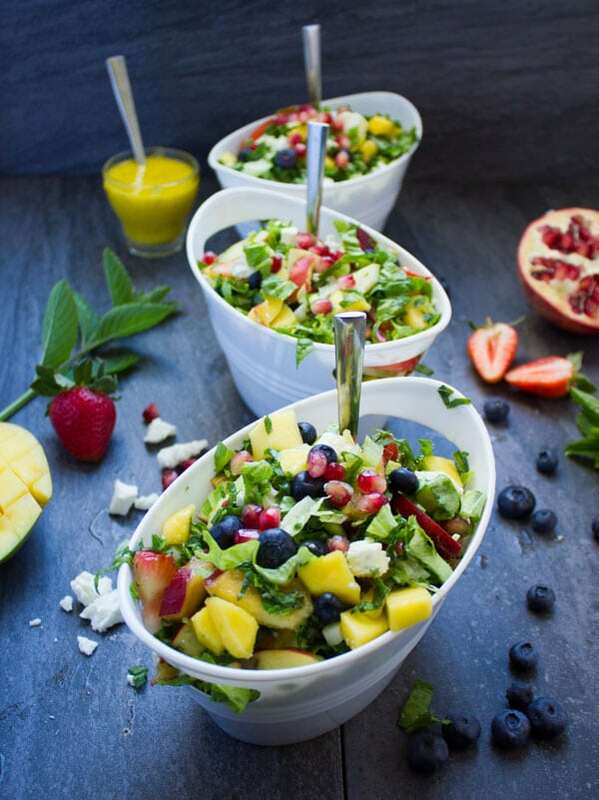 A fruity summery spin on Greek Salad with a simple and sweet Mango Dressing! 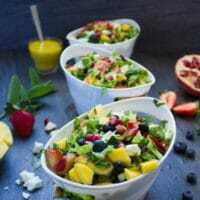 This vitamin-packed summer salad with apples, strawberries, pineapple, peaches, berries and creamy feta cheese is refreshing, sweet, tangy, crunchy, and simply fun to eat! 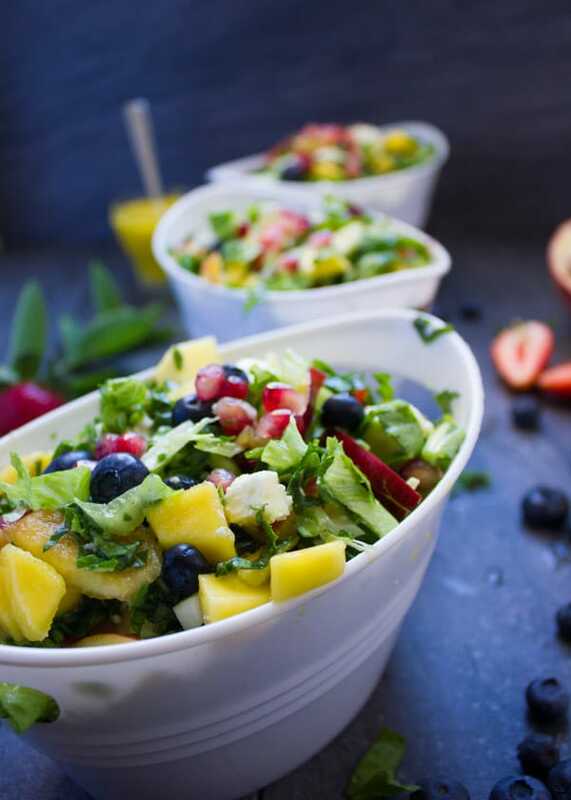 The mango salad dressing helps all the bright and fruity flavours to really shine! Toss all the salad ingredients in a large bowl. To make the dressing: Place all the ingredients in a mini food processor and process until smooth and creamy.